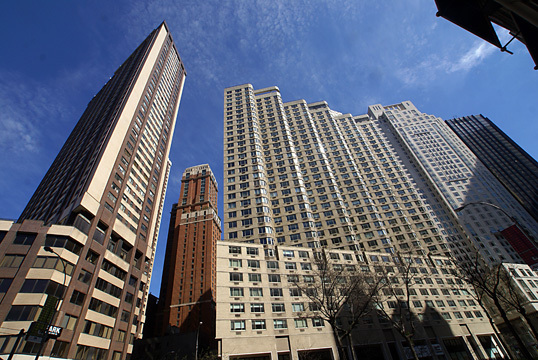 There are certain "key" buildings that set the tone for a neighborhood and One Lincoln Plaza was the first major new apartment house to be erected after the opening of the Lincoln Center for the Performing Arts in the 1960s. 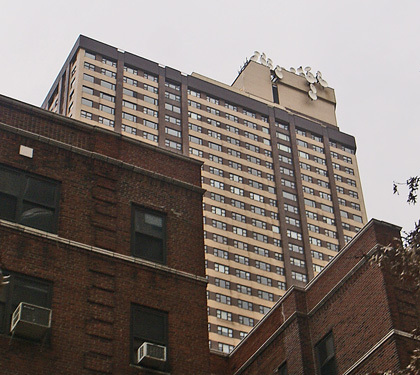 Erected in 1971, this 43-story building occupies the entire frontage on Broadway between 63rd and 64th Streets and its angled tower is set back on a low-rise base that frames a landscaped, mid-block plaza. It was developed by the Milstein organization that would build a slightly smaller apartment tower, 30 Lincoln Plaza, one block to the south that is notable for its multiple bay windows and very attractive mid-block landscaped plaza (see The City Review article). This tower is distinguished by its two-tone façade of beige and brown brick that provides vertical accents to the tower, scores of satellite dishes around its rooftop bulkhead, and its bent angled form. 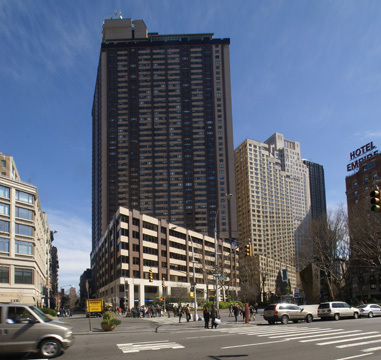 The tower is directly across Broadway from the large plaza with a fountain at the center of Lincoln Center and therefore many of its apartments have superb views to the west. 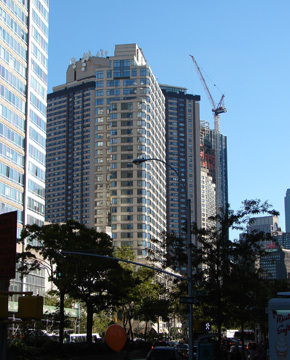 To the east, however, a new luxury apartment tower, the Park Laurel, was erected in 2001 in the nook of its bent angled tower thereby obstructing some of this tower's direct views to the east and Central Park. The tower, which uses air rights over the mid-block, Romanesque-style YMCA building, is very handsome and was designed by Beyer, Blinder, Belle. Some planners and design critics were disappointed in the quality of this building when it first opened as it is the most visible building in the area for those attending cultural events at Lincoln Center. Despite its extensive use of travertine marble, Lincoln Center's major buildings themselves were received with less than total enthusiasm by the same such planners and critics, who felt, generally, that the overall design of the center was more banal than breath-taking. Nonetheless, the center has proven to be very successful and eventually spurred a great deal of new residential construction, especially at its north end where several towers have been built with significant multi-level, large retail spaces. This neighborhood has many restaurants and stores and is one of the city's most bustling and has excellent public transportation. This building has a roof deck, a health club, a concierge, a garden, and a garage, but no balconies. Some restaurants in its base have sidewalk cafés. It is only a few blocks north of Columbus Circle where the Time-Warner Center replaced the former New York Coliseum and the twin-towered, mixed-use building features a large and very impressive Whole Foods store in its basement. While the overall appearance of this building is prosaic, its form is excellent and it holds the angled streetline of Broadway well. The building containsw 663 residential condominium apartments. 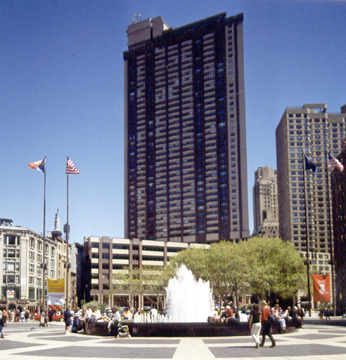 "In November 1966, following the completion of the Metropolitan Opera House, the architect William F. R. Ballard, who served as chairman of the City Planning Commission, proposed the construction of a monumental mall connecting Lincoln Center's main plaza with Central Park to the east. 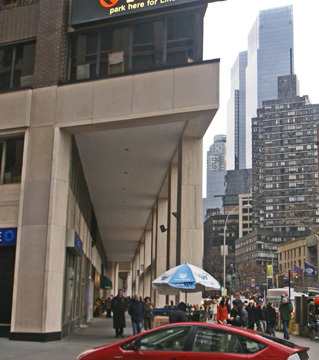 The landscaped mall was intended to fully occupy the block bounded by Broadway, Central Park West, Sixty-third and Sixty-fourth streets; a 1,000-car garage would be located beneath it. The mall had the support of Wallace Harrison who, along with other members of his advisory committee, had ten years earlier advocated the organization of Lincoln Center around a central plaza, which they hoped would ultimately be approached by a grand allée leading from Central Park....Ballard's plan...called on the city to acquire the property as parkland through eminent domain and would have necessitated the demolition of three architecturally significant buildings: the Ethical Culture Society School (Robert D. Kohn and Carrere & Hastings), 1902), on the northwest corner of Central Park West and Sixty-third Street; the adjacent Ethical Culture Society Hall (Robert D. Kohn, 1911), on the southwest corner of Central Park West and Sixty-fourth Street; and the West Side Branch of the YMCA (Dwight James Baum, 1930), at 5 West Sixty-third Street....vehement oppostion soon arose from the society, as well as from the YMCA and from the New York Academy of Science, which owned the western portion of the block and had already cleared the site to make way for a twenty-one-story headquarters building. Shortly after Ballard's proposal was announced, the industrial firm of Raymond Loewy/William Snaith, Inc., presented an alternate plan to Mayor Lindsay...[that] called for a complex of tall buildings to be erected between Broadway and Central Park West, Sixty-third and Sixty-fourth Streets. 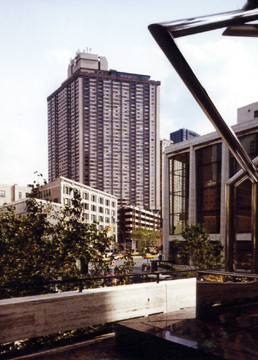 Widely spaced to provide unobstructed sightlines between Lincoln Center and the park, the buildings were to be set amid landscaped plazas with stores and cafes and linked by second-level pedestrian walkways that would span Broadway and Central Park West as well as provide access to Central Park. Snaith noted that the threatened institutions could be rehoused in new buildings on the site or that the proposed complex could be constructed around the existing buildings." 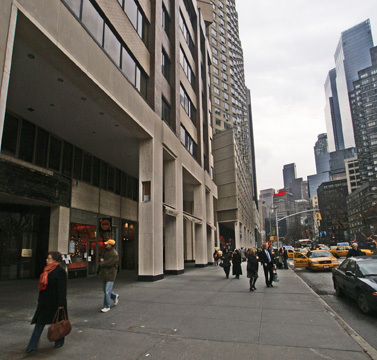 In 1969, the city enacted a 15-block special zoning district for the area and the first building to be built under its provisions was One Lincoln Plaza on the New York Academy of Science site that had since been acquired by Seymour Milstein. The authors noted that "Once the special district became law, Milstein, 'playing skillfully on the institutional jealousies between City agencies,' convinced the Board of Standards and Appeals to give him an additional 20 percent floor bonus over the bonus already allowed by the special district....The facades of Milstein's forty-three story tower were visually active though banal, combining beige and dark-brown brick; the building was far more significant as a reflection of the area's changing economic fortunes than as architecture....One Lincoln Plaza incorporated an eight-story base containing office space for the American Society of Composers, Authors and Publishers (ASCAP), as well as other tenants, and a commercial arcade facing Broadway....Norval White and Elliot Willensky called the building 'a spastic work' whose 'overwhelming skewed prism has no redeeming social significance." Such criticism is perhaps too harsh as the bent form of the tower significantly mitigated its visual dominance over Lincoln Center and the strong sense of verticality accented by its dark brown elements in tower also minimized, to an extent, its bulk, and its tall atrium was an important urban amenity as well that greatly improved the retail ambiance of the area. Nonetheless, it is true that the project's architecture is not inspired. Furthermore, subsequently construction tended to crowd and minimalize it.